Last night, I attended the 2012-2013 Bloody Thursdays season opener, put on by Friends of Mystery. 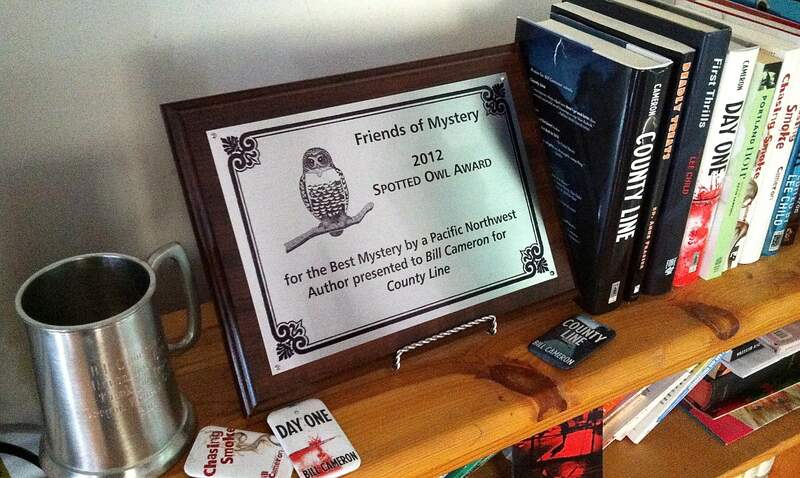 It was a special event for me, as it featured the presentation of the 2012 Spotted Owl Award for County Line. Also on hand was Johnny Shaw, the inimitable author of Dove Season. Johnny was awarded the inaugural Stan Johnson Memorial Spotted Owl Award for Best Debut by a northwest author. We both had a chance to chat about our writing lives. Johnny talked about growing up in the Imperial Valley and I talked about how I intentionally tanked a standardized test in the fourth grade so I could get back to the important work of reading my first mystery novel ever. I know folks took pictures, and hopefully they will share with me soon. That leaves me with the only pictures I have: of the marvelous cake above, and of the award plaque on my brag shelf. 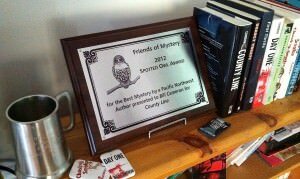 It was such an honor to receive the Spotted Owl, and it remains an honor and a privilege to be part of Friends of Mystery. Say hello to my friend, Braggy McShelfington. Large cheer! Wonderful, Bill. 🙂 Can’t wait to see more pictures. I love your friend Braggy McShelfington! Thanks, everyone. I’ve been doing a lot of petting of Braggy McShelfington all weekend.